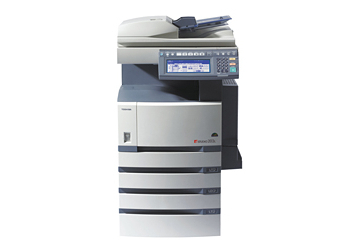 For the medium-size office that wants to only have the features they need, Toshiba offers the e-Studio 203L for 2-sided B&W copying, with options to add printing, scanning, facsimile, high paper capacity, and publishing. The e-Studio’s basic model gives you a lot of opportunities to customize it to your company’s exact needs. As two-sided copier, the 203L comes with a 550-sheet paper tray. The e-Studio has a tilt control panel with a touch panel display that switches from function menu to a QWERTY keyboard. Monochrome copies up to 12” x 18” can be made directly on the glass platen, or using the optional duplex Automatic Document Feeder (ADF). 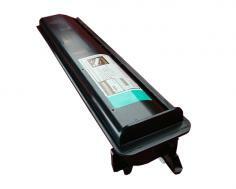 Zoom scales from 25% to 400% and up to 999 copies can be reproduced. By storing the image in memory, copies can be reproduced at 600 x 600 dpi at 35 ppm in B&W. One of the nice features of this multifunction is it can multitask. If the options are purchased, a person can scan or copy directly on the E-Studio while faxing and printing is being done via the network and phone lines. In less than 25 seconds, the e-Studio is ready to copy. The E-Studio 203L copies at an impressive B&W speeds up to 20 pages per minute. 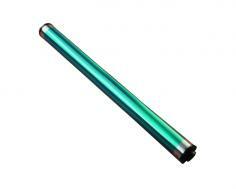 Duplex printing and Toner Save allows for savings on paper and in toner. Monochrome copy resolutions are enhanced to 2,400 x 600 dpi for sharp text and clear images. The optional duplexing Automatic Document Feeder (ADF) can handle 2-sided copying of up to 100 originals. The 203L comes with a 550-sheet cassette tray that supports papers from 8.5“ x 11” up to 12” x 18”. A 100-sheet multi-purpose bypass tray handles various paper weights from 17 to 110 pounds and sizes up to 12” x 18”. Additional high-volume paper trays are available to provide up to 3,700 total pages. The printer option comes with USB and Ethernet. The stock 256MB of memory and a 40GB hard drive enables this e-Studio to handle most print requests and to encrypt saved jobs to the hard drive. Toshiba has included HP PCL6, and Adobe PostScript3 print emulators to satisfy the most office demands. Two optional Finishers can give the 203L full publishing features from stapling, multi-hole punch, to saddle-stitch binding for catalogs and magazines. Optional data facsimile via a 33.5Kbps modem allows faxes to be transmitted at less than a second per page. Scanned documents using the optional scan kit can be exported as 600 x 600 PDF or TIFF files and sent to e-mail. Toshiba allows for public and password-protected folders to be stored on the e-Studio’s 40GB hard for saving scans, copies, prints, and faxes. Because the 203L is configured for customization by the buyer, the buyer should beware that the “stock model” is simply a copier. (Ask anybody who owns a Harley motorcycle: nobody owns a “stock” Harley without putting some add-ons to it.) If you don’t have a technical person in your business, I suggest to most businesses to get the automatic document feeder, and extra paper capacity to make it a more useful copier. Review it: "Toshiba e-Studio 203L "
The black toner provides 5% coverage on 23,000 pages. Just remember that if you’re doing full- spread layouts and photograph prints, the actual toner usage per page is going to be at least 10 times more, reducing the number of pages you can get out of a cartridge. Other consumables to consider are replacement of the imaging unit (drum) every 3rd toner, the fuser and transfer roller, and the waste toner bottle.